This exciting blog tour with Celebrate Lit, featuring “The Essence of Joy” has flown by. 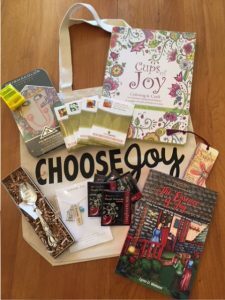 With two days left and an awesome joy-themed prize package at stake (see photo below). be sure to cruise around the hosting sites, and enter for your chance to win! All the info required for your “trip” is in Celebrate Lit’s post. You may enter at each site, and depending on the actions you choose, you may receive up to nine entries each time. That is a WHOLE LOT of opportunity for you! Be sure to grab your copy of the book, too. It may be Christmas themed, but as several of the bloggers point out, it’s a great read any time of the year! Wondering who will win??? You may be the one!